Pathways is constantly working towards new and innovative solutions designed to give you peace of mind with your finances when it comes to account security. With the increased number of data breaches and hacks affecting millions of Americans, the security of your personal information is more important than ever, and that includes the everyday use of your Pathways Debit and Credit Cards. 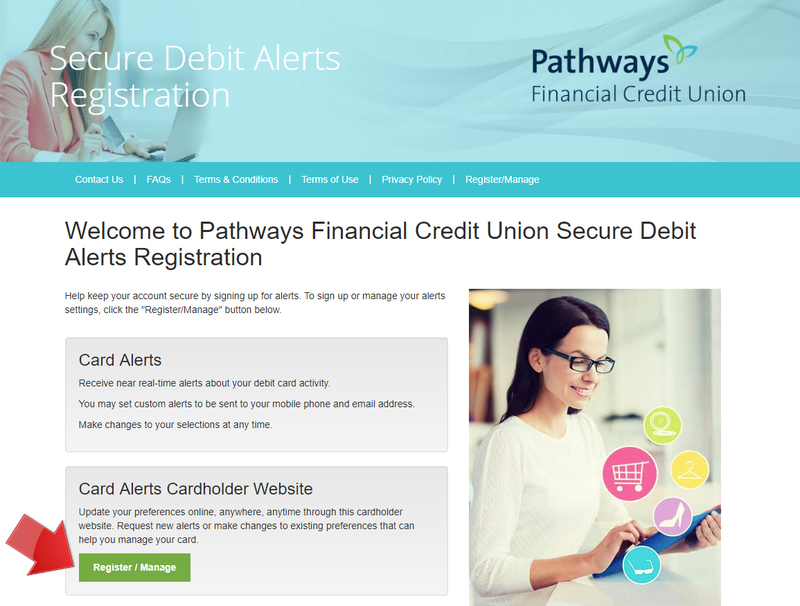 As a member of Pathways you get FREE alerts through our Online Banking service. 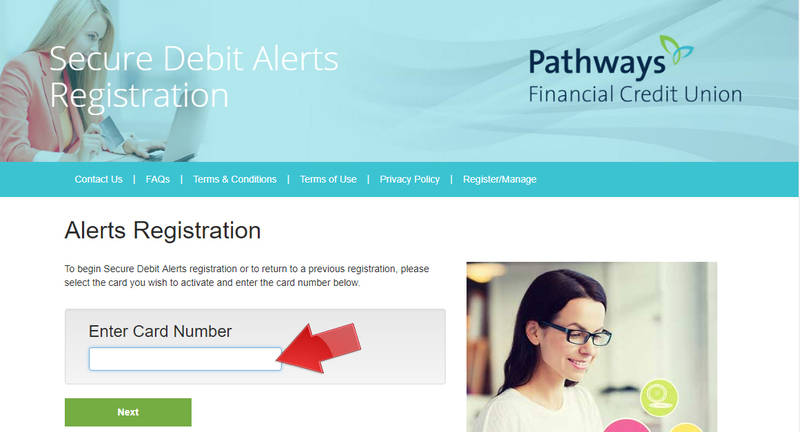 The instructions below will help walk you through the process of enrolling your Pathways debit or credit card, giving you the ability to be instantly informed of any potentially erroneous activity via email or mobile text. 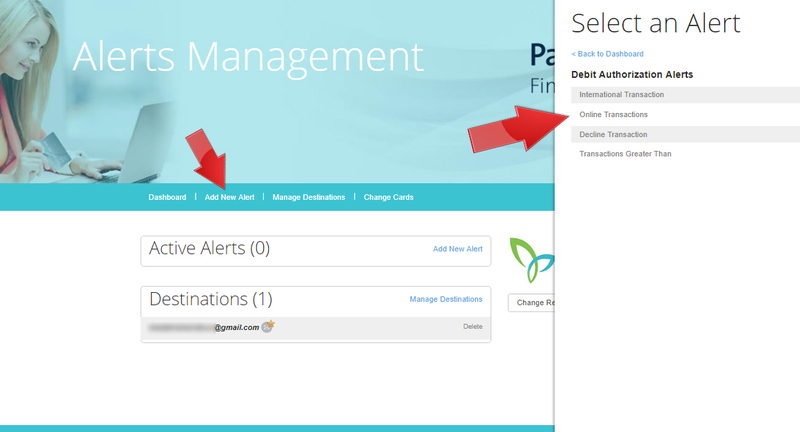 When in Online Banking, select “My Accounts” from the menu bar, and then select Card Alerts under the “Manage” menu. Or you can click here. You will then be presented with the option of creating an alert for a Pathways Debit Card or Credit Card. Click the button of the card you wish to create an alert for to proceed. For the purposes of this tutorial, we will be following the Debit Card registration process, so the title will say Debit Alerts, but credit cards and debit cards both follow the same registration process. You should now be on the Alerts Registration page. 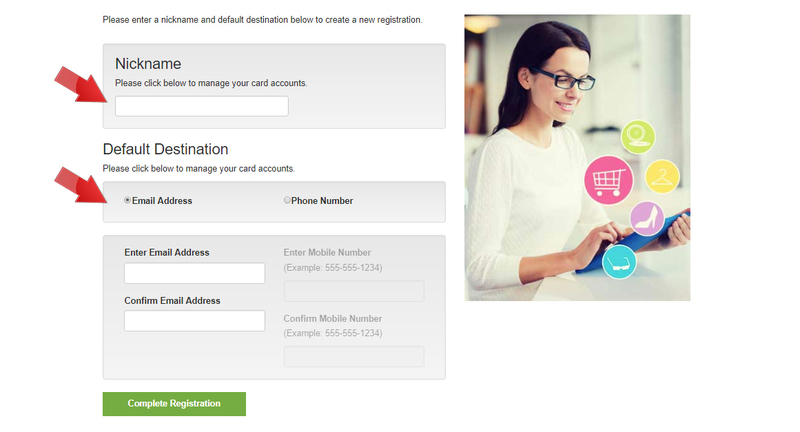 Click the button indicated by the red arrow to Register your new card. Note that this button can also be used to manage previously enrolled cards as well if you have already gone through this process with a card already. 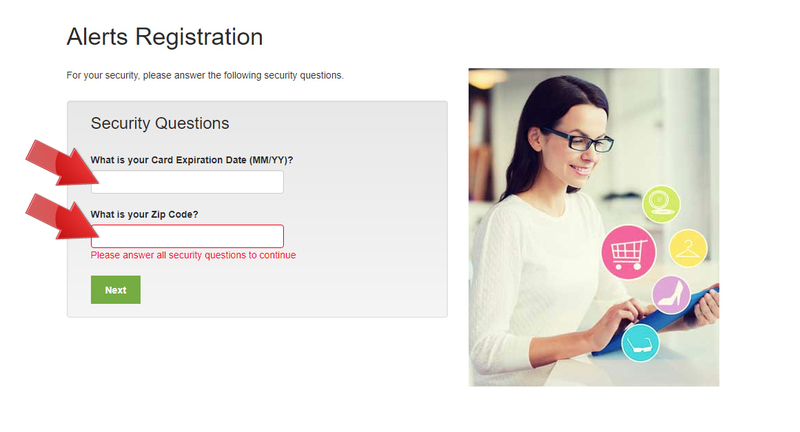 After you press that button, you will be asked to enter the card number in the field indicated by the red arrow. Do so and click the Next button beneath it. After you press Next, you should see the screen below. Now that the alert system has your card number, it will also need the expiration date and the zip code associated with your Pathways account where the red arrows indicate. This is to ensure account security.If you are unsure about the zip code, it is the zip code used for where the card was originally mailed to you, which is usually your home address. Next, you will be asked to give your registered card a nickname and to provide a primary contact method for the alerts. You can have the alerts sent to your email, or via mobile text. Note that for texts your normal mobile phone carrier text rates will apply. With your alerts selected, you should get an email confirmation. 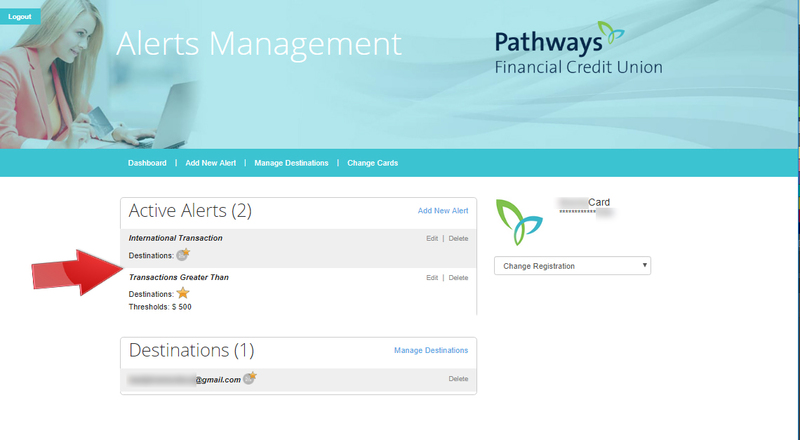 Afterward you can review your alerts in the Alerts Management page, which will also include your card’s nickname, preferred methods of contact, and the last four digits of the card number as a reminder of which card is being monitored. When you receive an alert on your debit or credit card that may indicate erroneous or illegal activity, Pathways associates are here to assist you. Simply call the number on the back of the card (1-800-449-7728) and a Pathways contact center specialist will be ready and able to assist you with whatever was reported.